It’s beginning to look a lot like Christmas …. everywhere I go… literally… EVERYWHERE! and I like it! One of things I love about Christmas is baking. My husband and I always host Christmas dinner at our house and we have his closest family over (now my family too). 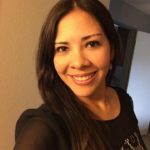 For me, Christmas is a little bit sad because all of my family is in Peru but I’m planning to make a trip in January so that cheers me up! Anyway, Christmas is one of my favorite holidays and I always make a big list of things to bake and one of my favorite Christmas cookies are called LINZER. 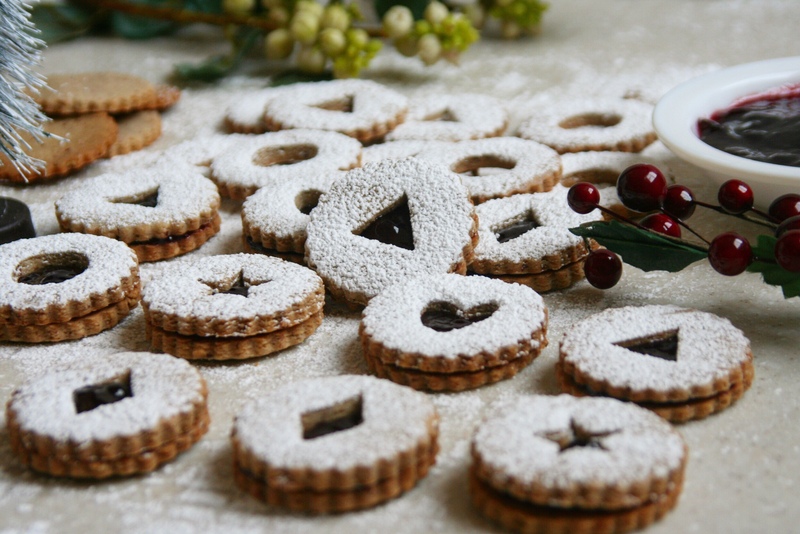 I’m sure you’ve seen linzer cookies around, but store-bought are not the same as homemade. 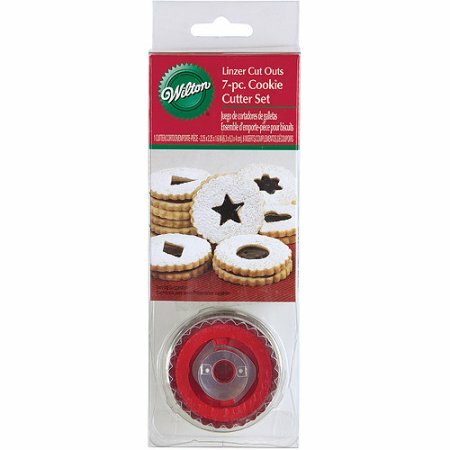 So… What is a Linzer Cookie? This is the cookie version of the Austrian dessert Linzer torte. Born in the City of Linz, the tart consists of a crust made from flour and ground nuts — traditionally almonds or pecans — filled with black currant preserves and topped with a lattice crust. 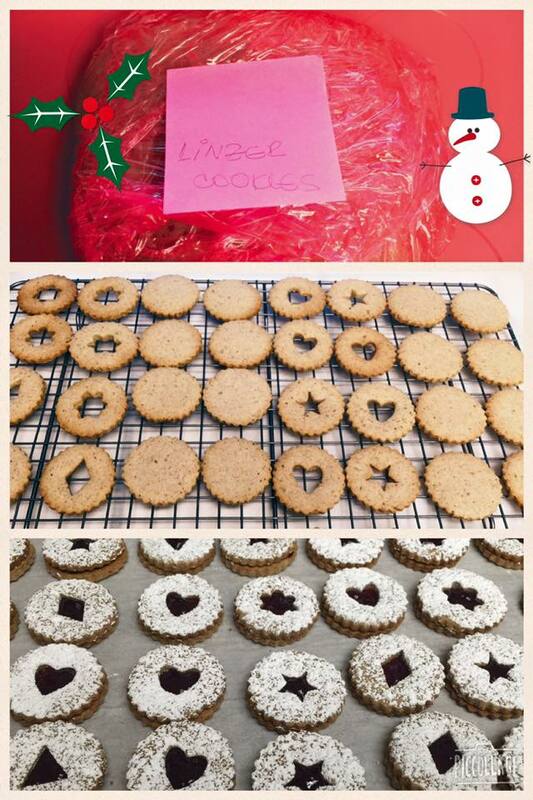 My linzer cookies are made with pecans and they are filled with a seedless raspberry jam. Important Note: You have to toast the pecans before you start with the recipe or you can get toasted pecans (you can find them at Trader Joe’s). Put the pecans on the baking with parchment paper and toast them just until they become aromatic, about 5 minutes. You have to watch them carefully because they can get dark super fast. Let them cool completely and then START the recipe. 1.- In a small bowl, combine the flour and baking powder; whisk to blend. In the bowl of a food processor, combine the pecans, powdered sugar, salt and cinnamon, and pulse until the pecans are finely ground. 2.- In the bowl of an electric mixer, combine the butter and granulated sugar. Beat on medium-high until light and fluffy, about 2 minutes. Blend in the egg and the vanilla. With the mixer on low speed, add the flour and pecan mixtures to the bowl and mix in just until combined and a dough forms. Form into a disc, wrap in plastic wrap and chill until firm, at least 2 hours. I usually make my dough the night before I bake my cookies. 3.-Preheat the oven to 375˚ F. Line baking sheets with parchment paper .On a lightly floured surface, roll the dough out to 1/8-inch thick. 4.- To make the bottom cookie, simply take the cookie cutter apart by squeezing the edge and releasing. This will give you a cookie cutter to make the base/bottom cookie. Then, put the cookie cutter back together to make the top cookie. When pressing down on the dough with the cutter, simply press the ejector. Remember you will need the same amount of bottoms and tops. 5.-Transfer to the prepared baking sheets. Reroll dough scraps as needed. 6.-Place the cookies in the fridge for 15 minutes to chill. This will help to keep the shape of the cookies. 7.-Bake, rotating the pans halfway through the bake time, until beginning to brown and just set, about 10-12 minutes. Transfer to a wire rack and let cool completely before filling. 8.- To fill the cookies: Place the cookies with the holes in them on a cookie sheet and sift the confectioners’ sugar over the top. Turn the remaining cookies flat side up and spoon 1/2 teaspoon of jam into the center. Stick both parts together and enjoy! This entry was posted in Recipes and tagged baking, Christmas, cookies, dessert, food, Linzer, linzer torte, pecans. Amazing.. I am going to try this recipe. Thank you for sharing. You are very welcome! Let me know how your cookies turn out!